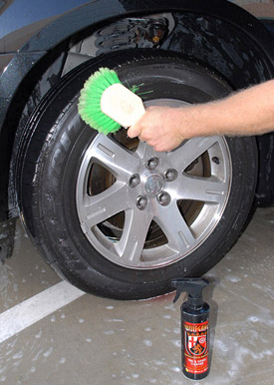 Wolfgang Tire & Wheel Cleaner is formulated for versatility, this cleaner is as equally gentle and effective on wheels as on tires! I like The way it doesnâ€™t leave any streaks and it smells good too. I also like how much the sprayer sprays, it sprays just the right amount not too much . I donâ€™t think Iâ€™ll be buying any other detail spray anymore. I used this on clear coated aluminum wheels and am very happy with the results. I just followed the directions and with a soft bristle brush they cleaned right up. I previously used meguiars hot shine for aluminum and was not happy with it. I always had to apply multiple times and I still had to scrub with soap and water afterwards. Once I sprayed this on I was prepared to scrub but immediately I saw the dirt and grime dripping off! I brushed anyway but this stuff is fast and does a thorough job. I should have ordered a larger size and will do exactly that next time. It is simply the best I've ever used. ProsFast, cleans great with minimum effort. ConsDo not let dry before rinsing. I thought I'd give this a try since I was already ordering some other products. It works really well, and my wheels and tires looked clean. However it took several trigger pulls and a fair amount of cleaner on each wheel to get what I thought was enough cleaner on the wheel. I've only used this once, and my car is like most with 4 wheels, and I've used a fair amount of the cleaner. So at $25 it feels a bit expensive if you wash your car weekly and use this product. Maybe this is a once a month use, when the wheels are really grimy. ConsA bit expensive, and a fair amount of cleaner is needed for one wash. 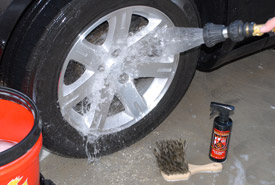 I've been a long time user of P21S for my wheels, but I've found this product to be an effective tire cleaner. 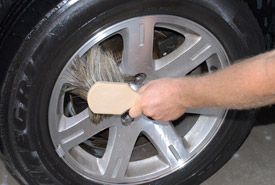 The dirt and gunk come to the surface very quickly and it leaves a clean sheen behind when the tire is dried.